A man left a fake bomb outside Paisley Central Mosque in retaliation for the London Bridge terror attack. 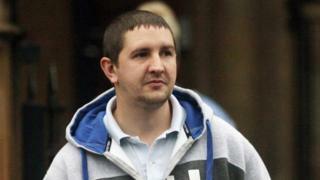 James Palmer, 31, admitted making a bomb with items he had at home after watching news coverage of the atrocity. The following evening he left a blue plastic bag containing two gas canisters, taped together with wire and wood, on the steps of the mosque. It was accompanied by a handwritten message which read: "Youse are next, defo." The night before, eight people were killed in London when three men drove a van into pedestrians on London Bridge. In the chaos that followed, the terrorists launched a frenzied knife attack in nearby Borough Market. Paisley Sheriff Court heard the chilling attack was responsible for Palmer's drunken decision to make a bomb of his own and scare Muslim worshippers during Ramadan prayers. The details emerged when Palmer appeared in the dock to admit his guilt over the bomb hoax. He admitted a charge which stated that he "did place at the entrance/exit doors a package with the intention of inducing in some other person a belief it was likely to explode or ignite and thereby cause personal injury or damage to property." His crime was also "aggravated by religious prejudice". Procurator Fiscal Depute Claire Nicholls said the offence took place about 19:35 on Sunday 4 June. About 20 people were inside at the time. Ms Nicolls said: "The witnesses left the locus and noticed a suspicious package sitting at the entrance and exit doors to the Mosque. "They observed a blue plastic bag with two aerosol cans labelled 'heavy duty strong adhesive spray', taped together with white wiring, giving the impression it was a bomb. "There was a small note through the wire which read, 'Youse are next, defo'. "The police were contacted and it was established that the item was fake." Palmer, who is from Paisley, was captured on CCTV and a media appeal was launched to help track him down. A friend saw the image and contacted Palmer who handed himself in. He told officers: "I'm the guy that put the bomb at the mosque'." Palmer acknowledged his stupidity and added: "I was out of order." Defence solicitor Rhona Lynch said Palmer had been driven to make the fake bomb because of what he had seen on TV from London. The lawyer explained: "He was heavily intoxicated and has to accept that at the time it was in the aftermath of the relevant attacks. "He was sitting watching TV in his flat and that appears to be what has motivated him to put this bomb together. "He has to accept that's what caused him to do this - the fact it was a mosque as opposed to any other religious building." Palmer also accepted the worshippers would have been scared following his actions. Ms Lynch added: "He is deeply and genuinely remorseful. "It was two empty aerosol cans, which he found in his flat when he moved in, in a plastic bag. It would have been obvious to anyone coming across this it was not a viable item. "But he accepts the situation would cause fear and worry. "He was physically sick in the garden when he realised what he had done, such is the flavour of disgust and shame that he genuinely feels." Sheriff David Pender said the offence had been "a retaliation - a response" to the London Bridge attacks. He called for Palmer to be assessed by social workers ahead of sentencing and adjourned the case until next month.